Habitat: Strictly Arboreal. Trees and bushes over bodies of water, swamp and marshes in lowland rain forests. This beautiful snake is one of the most dramatically colorful snakes in the Class Serpentes. It has brilliant leaf green coloration with white markings along its whole body. These white markings against the green body closely emulates the patterns of sun splotches that penetrate the thick rain forest canopy. As this snake grows older the green slowly becomes darker. This camouflage pattern varies throughout the habitat and locale where individuals live. The Emerald Tree Boa has an internal egg gestation of five and a half to seven months. It seemingly bears its offspring live, however this is due to the fact that females will lay their eggs right at hatching time where sometimes the egg hatches before, during or after they are laid. The young snakes initially are born an earthy orange-red color with white bars; through time this color eventually changes to leaf green over a few weeks period at 4 to 9 months of age. This snake has a life span of around 15 years. The stout body tapers at the end with a strong prehensile tail that gives them the ability to anchor on twigs and branches where they lie motionless. 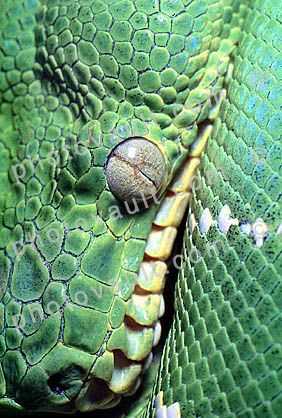 The Emerald Tree Boa have very long teeth with which it holds its prey (to get through the bird feathers). Its diet consist mostly of rodents and birds. This snake can gain in length up to 2.2 meters.